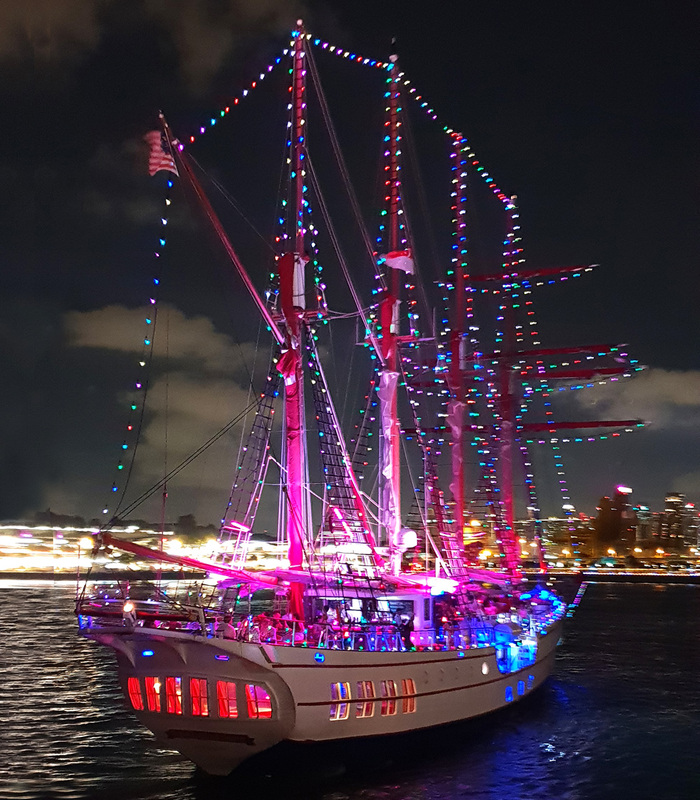 Be it a romantic date, a special celebration or quality time with family and friends, our Sunset Sail/ Dinner Cruise takes you on an unforgettable journey that you’ll share forever on-board the regions only luxury tall ship. Your superyacht experience begins as we sail out from Resorts World Sentosa (RWS) and head for the tranquillity of Singapore’s calm port waters. 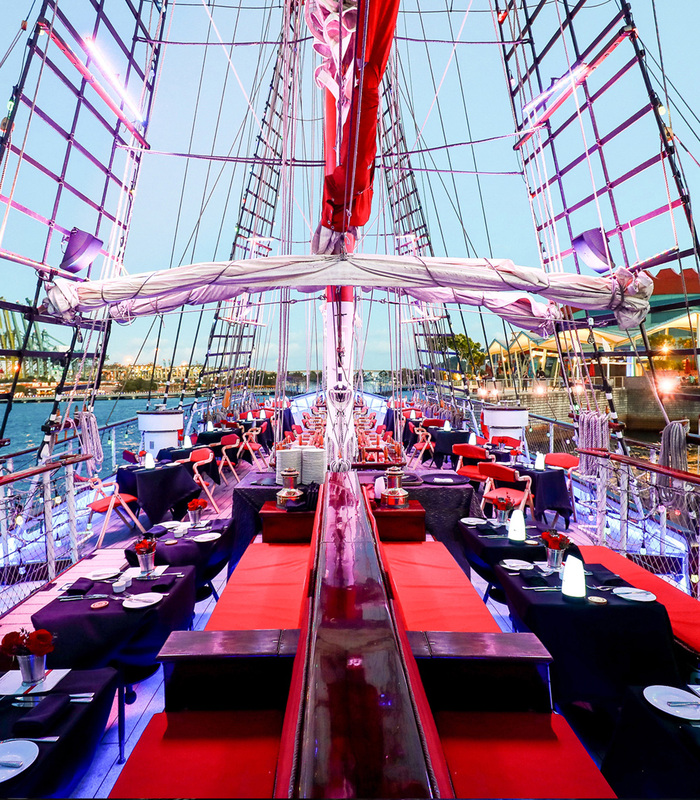 As the crew scale the masts to set sail, the sea folds around you as you dine your own private table on the upper deck with the traditional rigging of this 4-mast 22-sail luxury Tall Ship towering overhead, creating a truly unique ambiance like no other! With an air-conditioned Grand Salon on the main deck, two premium bars, a flying seat and carefully selected entertainment, our harbour cruises have all the ingredients for a perfect evening onboard our amazing superyacht. Our sunset cruise sets sail just as the sun heads for the horizon although guests are welcome to arrive early for an onboard reception, tour of the lower decks/cabins and to meet the crew who run this unique superyacht. 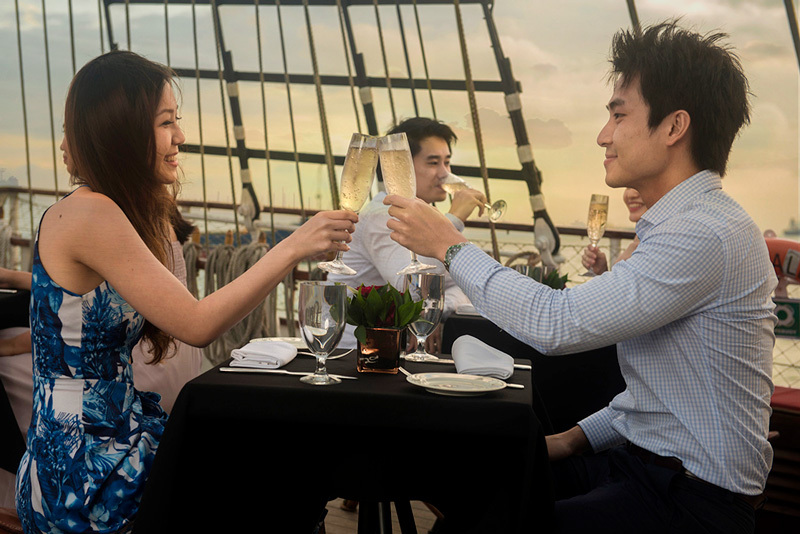 Take in the sea breeze while sipping your favourite beverage as we sail past Sentosa’s white sand beaches and some of the most prestigious property in Singapore before an unparalleled view of Singapore’s cityscape and skyline reveals itself. As we enter the golden hour and sun starts to go down, capture the “Kodak” moment under a canopy of sails. With gourmet bar bites available (additional cost), the cruise is a perfect gift and ideal for celebrations, visitors, private meetings or just having a good time! 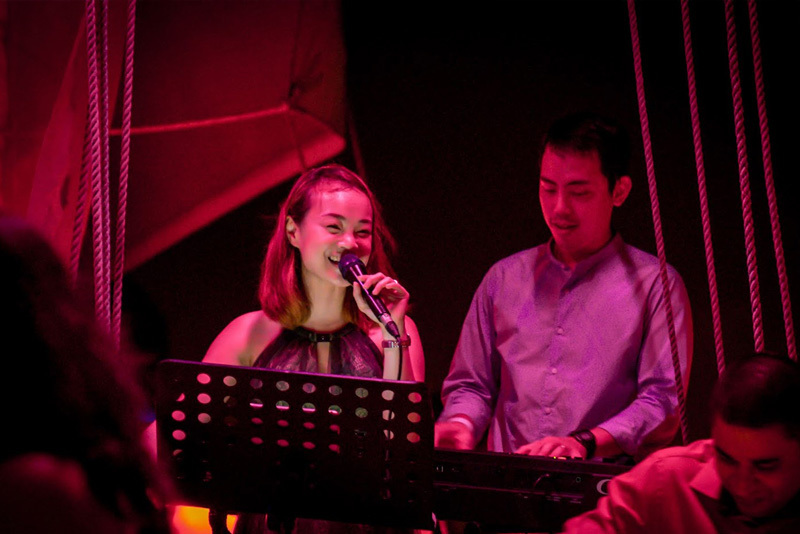 We have curated Singapore’s most memorable and romantic dining experience just for you! 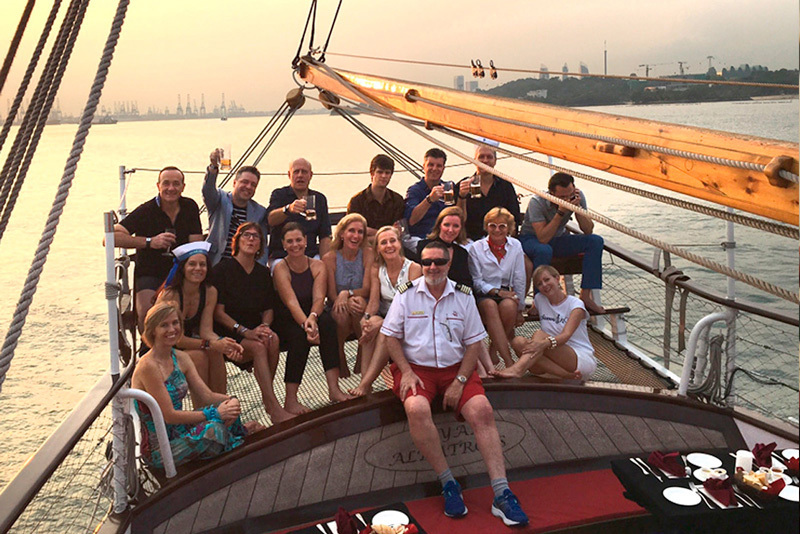 Arrive at your leisure from 630pm for our wharf side sunset reception before boarding our magnificent tall ship and setting sail at 730pm for an unparalleled view of Singapore’s City and Marina Bay skyline at night. 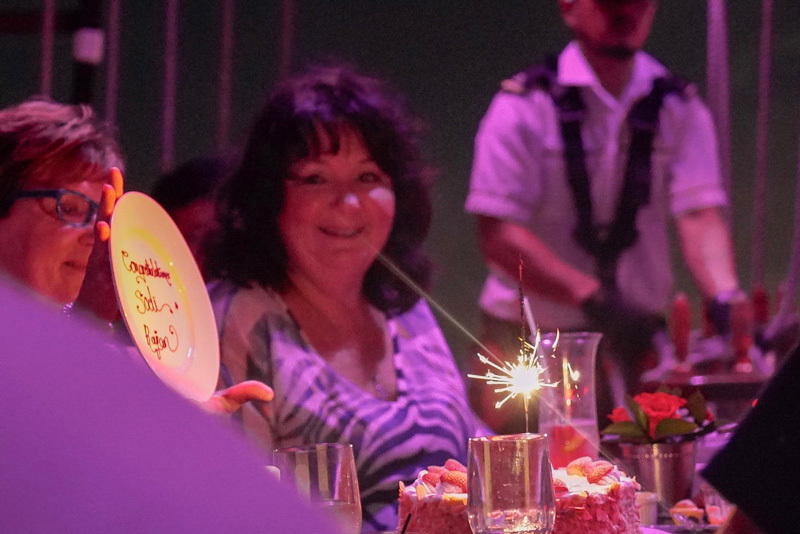 A sumptuous international 3-course dinner is promptly served, allowing you time to sit back and relax with your favourite digestif as the ship turns south and slowly manoeuvres through Singapore’s Southern Islands of St John’s and Lazarus on her way back to her berth at RWS by 10pm. Perfect for couples and small groups who are looking for unique experiences and appreciate an amazing romantic ambiance under a canopy of sails. *Sailing dates are opened 6 weeks prior to sailing dates, please check back within 6 weeks for your preferred sailing date. 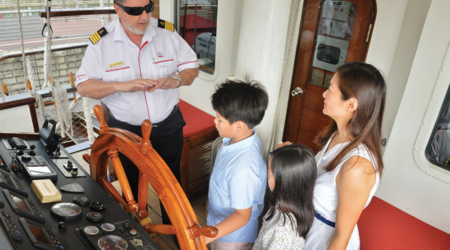 The Royal Albatross is a unique Singapore experience that you can make even more special and memorable with add-ons such as flowers, champagne, unique folding gift card sealed with wax and exciting onboard activities like “climb the mast” and “take the helm”. If you are looking for a unique experience or boat ride with a difference, you’ve found the venue. Book your sailing tickets now and let us do the rest for you. Experience one of the more challenging aspects of a sailor’s life and climb the mast 21 metres above the decks of the Royal Albatross. This traditional tall ship boasts four masts that tower high above the waters of Sentosa. They support 22 sails all manually operated by 200+ ropes. The Mast Climb is great for that once-in-a-lifetime video/photo on top of a historic tall ship, an exhilarating activity for you at Resorts World Sentosa.